To start a voice over business, the first thing you need to have is, of course, your voice. When you have a good voice, and are able to deliver messages with power and clarity, the next equipment you must have is a condenser microphone. You can choose from various types, but the quality of the microphone really depends on the price. The higher you pay, the better usually the microphone is. I understand that Indonesians like simplicity and affordability, so my suggestion for any voice artist in the country would be USB microphone. You just need to plug an record. As simple as that. With a USB microphone, you can record voice overs in free softwares like Audacity or in premium audio applications like Pro Tools and Adobe Audition right from your home. Although some voice actors say that USB microphone is a big no and a sign of amateurism, it can actually result in an amazing audio quality when you know how to set up and record correctly. 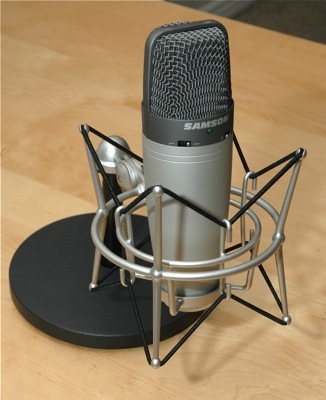 Among my favorite USB microphones are Samson C01 and c03, ranging from Rp 1 million to Rp 2 million, or about $100 to $200. Both series are also available in XLR version; the USB usually is higher in price due to its portability. Or you can also go with Samson Meteor for a lower price. All the above mentioned microphones use standard polar patterns: dynamic, eight figure and cardioid–which is good for voice over. You need to record correctly and treat your room acoustically to produce high quality voice using one of these microphones. Tools such as pop filter and shockmount are also very important to help create good audio.